Edusson.com is an essay writing service that has 1000+ qualified writers. However, you need to give them your project first and have their writers bid for it. You place your order on their system, the writers bid for it with different prices, and you may look over their portfolios before you hire them. It is free to sign up for an account and there is also an app. They claim there is a 100% plagiarism content guaranteed, and they will make sure all your information will keep safe and private. They have a 24/7 customer service line, and a live chat widget and you may contact your writer directly. Edusson.com write essays from scratch and also have a proofreading and editing service for essays and papers students write themselves. They are different from many services in that is it almost self-service. Most companies assign their writers based on best person for the job. Edusson allows writers to bid for the orders. You have no guarantee of the qualifications, standards and experiences of the writers, nor any confidence that the company has any quality control. Read online reviews and some are very damming, even including complaints of plagiarism. It seems very much that Edusson is simply acting as a middle man. They provide the platform to enable you to engage with writers and all they do is take the money. The site claims a guarantee of 100% plagiarism free but there is no evidence that they vet writers’ finished work in any way and solely rely on the integrity of the writers. If you are going to hang your academic performance on a dissertation written by a 3rd party, wouldn’t you want some guarantee? When hiring the writer, the amount you pay for him/her will depend on how much money the writer bids. If you don’t want to go through a bidding process you can pay $9.99 to allow Edusson to select a writer. It is somewhat disconcerting to see complaints all over internet forums about the massive markup Edusson make to the writers’ bids. Obviously, if you are happy with the price quoted and the work that is delivered this is not an issue. Edusson doesn’t have special offers or discounts for using their service. The reason for this is because the service works by having writers bid on your essay. There are no set prices. The way you pay less is simply by choosing the lowest priced bids. Writemyessaytoday.net is a custom writing company based in Los Angeles, CA. It is a new company, providing students with academic assistance since 2017, which means they have not yet established a clear reputation on the Web. For this purpose, we are going to evaluate everything the company offers including the website design, services, prices, discounts and special offers. The company’s website is very plain in design, but easy to navigate. However, the most concerning thing here is that they have no list of services anywhere on the website, so one would have to sign in to even check if the company offers their paper! The company actually offers quite a wide range of services such as essays, articles, bibliography, case studies, coursework, literature reviews, movie reviews, presentations, dissertations, admission papers, editing and proofreading etc. The ordering section also allows customers to choose between paper formats. The company has not created page for guarantees, blog, samples or even an About Us page, but the Prices page is one of the very few that can be found here. According to the pricing table, prices depend on urgency, academic level and type of service. However, all papers written from scratch come at one price, which we found to be a bit unprofessional and concerning. Why would a company charge the same amount for an essay and a dissertation? Pricing at writemyeesaytoday.net is affordable, starting from $10 for undergraduate level within a deadline of 14 days and ranging to $56 for professional level with a deadline of 3 hours. However, you get the option to choose one of the top writers to work on the paper, but you have to pay an additional fee. With this fee added, the price is no longer as affordable as the original offer. What we found to be strange regarding this extra fee is that the company promises that every writer has 10 years experience and a degree as high as a PhD. If all writers in their team are this educated and experienced, who are the top writers, then? The biggest disadvantage of this service is that discounts do not exist. There is no such thing as a first-order discount, returning discount or even a bulk order discount. Write My Essay Today is a legit company, but their website needs some serious improvement in terms of information. Perhaps the reason behind this lack of information is that the company is new on the market, but the lack of discounts also adds up to our decision not to recommend this provider to those in need of academic papers. Quality papers written by only native English writers, unlimited free revisions and plagiarism free papers are just a few of the numerous promises of a company named writemyessay4me.org. At first glance, the official website of the company looks trendy and easy to navigate, except for few mistakes in terms of content we noticed on the homepage. However, being a company that evaluates writing services, we immediately noticed the similarity between this website and the one of pro-essay-writer.com. Our guess is that both these websites belong to the same company. As is the case with the other website, Writemyessay4me.org also does not have a Services page or a list of services anywhere on the website. The only way to check if your paper is something the company provides is by checking the dropdown list in the ordering section. According to this list, the company delivers the following services: essay, coursework, research paper, term paper, book report, movie review and case study. This is a fairly limited list of services since it includes only a few of the most commonly requested papers. In addition, it is the same as the one of pro-essay-writer.com, which only confirms our theory of the same provider selling papers through two separate websites. Prices start from $12 for a paper with a deadline of 10+ days for high school level and range up to $50 for PhD papers with a deadline of 12 hours. However, the fact that the quote of a paper depends on the urgency, academic level and a number of pages only, we are seriously concerned about the quality of papers this company provides. The difference between simpler papers such as essays and more complex ones such as research papers demands for more time and expertise. As for discounts, the official website of WriteMyEssay4Me does not include mention of any kind of price reduction. So, if you decide to order your papers from the service, you should not expect first-order discount or lifelong discounts based on accumulated pages. There is a discount code field in the ordering section, so we are guessing that the company sometimes provides a special offer. However, at this time, there is nothing of this kind on the website. Since the similarity between this website and that of pro-essay-writer.com is very clear, our conclusion here is also the same. Both these companies do not offer a wide range of services, nor any discounts or special offers. Even though the pricing is affordable, this is not a service we would recommend. Pro-essay-writer promises to deliver 100% original papers, written by UK and US native English writers. Additionally, all orders are backed with a money-back guarantee. Whether these promises are valid, this review is about to evaluate. The website does not provide a Services page or a full list of services, except the Ordering form where you can pick your paper from a dropdown list. From what we could see on the website, customers can order essays, case studies and book reviews. Furthermore, the ordering section gives you the choice between term papers, book reports, research papers, editing and proofreading services. This list is far from exhaustive since many of the commonly requested academic papers are not given as an option. Therefore, if you were looking for a regular provider of academic papers, this would not be the best choice for you. What we found to be concerning was that prices do not depend on the type of academic paper you order, but on urgency and academic level only. This means that the quote will be the same regardless of the paper you order, which makes us believe that the quality is not what the company promises to be. You cannot expect to pay the same price for a page of an essay and a research paper, since the two are very different in terms of complexity and structure. Pricing of ProEssayWriter is affordable, except if you choose the option of top 10 writers working on your paper. They start from $12.00 for a high school level and deadline of 10+ days and range up to $50 for PhD level and a deadline of 12 hours. Except for the statement ‘ongoing discounts along with attractive offers’, there is no other indication or explanation as to what discounts this company offers. We found no discount code or a spot where you could add a code in the ordering form, nor any kind of first-order, bulk or lifelong discount. A short list of services, non-existent discounts and vague pricing policy are only a few disadvantages of pro-essay-writer.com. Even though this is a relatively affordable service, it is not one we would recommend to students, regardless if they are looking for one-time writing assistance or regular writing provider. The non-existence of any kinds of discounts does not allow people to try out the service at a reduced price. PaperCoach.net is a writing company that offers a unique opportunity of splitting the payment apart. Additionally, the service promises high-quality papers and unlimited free revisions up to the point where you find your paper to be perfect. Sounds inviting, doesn’t it? Let’s see if the company stands behind these promises. At first glance, the PaperCoach company looks trendy and inviting. However, once you take a closer look, you will notice that the website has a serious lack of information since even some extremely important pages such as Services or Discounts are missing. If you want to know whether the company can write your paper or not, you can only check this in the free calculator on the home page. The dropdown list contains the majority of commonly requested papers and some more specific papers. According to this list, you can order essays, dissertations, article reviews, biographies, case studies, business plans etc. Pricing depends on the number of pages, academic level and urgency. Interestingly, there are no separate prices for different types of papers, except for three main categories: writing from scratch, editing/proofreading and problem solving. This means that both simple and complex papers would cost the same, which is a bit concerning. According to the Pricing table, the lowest price for a page of written content is $8, while the highest one is $66. This means that PaperCoach is a relatively cheap service, perhaps even too cheap for the high quality they promise to deliver. Discounts are nowhere to be found on the official website of the company, nor are any codes or special offers. The company highlights the opportunity to pay for the paper after checking the preview version, but the only solution they mention in the case you do not like the content is unlimited free revisions. Considering that students are often on tight deadlines, they may not benefit from this offer at all! Now that we have evaluated the services, pricing and discounts, it is safe to conclude that this is a legit and cheap company. However, the vague content and numerous empty promises on the website indicate that the company bites more than they can chew, especially because the feedback we found online reports bad content. The biggest misunderstanding of all is that, even though the service gives you the opportunity to pay for your paper after it is written, this does not mean that you will not be charged if they write a bad paper. Would you be interested in picking the writer that will work on your academic paper? Essayvikings.com is a company that allows exactly this. According to their website, this is your best choice when it comes to academic assignments of any type. Check out this review to see if this is true. The first and probably biggest disadvantage of essayvikings.com is the website content. The design looks trendy and inviting, but we found a concerning number of mistakes in terms of content. Additionally, some information is very difficult to find since there is too much irrelevant content on the website. From what we could see, you can choose any type of content from this website. This is one of the very few companies that work with freelancers who bid on your papers, which means that you can order any type of paper and make a choice from those who consider themselves experts in the field. This leads to our main concern – how will you choose a good writer? Surely, there are comments and profiles for every writer, but we are not sure these are real since the majority of them have five-star rating. Pricing is also not something we can tell you about since this will depend on the writer you choose. After you sign in with the service, you can post your requirements and pick one of the writers who bid on it. The only indication of a price on the website is a quote that says ‘special offer $16.00/page’. If this is the lowest price the company offers, it is not really an affordable one. Discounts on EssayVikings are non-existent. This is expected since the pricing is given by the writer. Therefore, you should discuss the price with the writer and if you are good at bargaining, lower the original bidding price. The most unique thing about this service is that they do not charge customers when they make their order. Apparently, all you have to do is sign in and enter the order information, pick the writer and pay for the content once it is delivered. They say you do not have to release funds if you are not satisfied, but many customers have reported that the service charged them for the content claiming that it is good. Feedback online is split, which only confirms our concerns – there is no way to guarantee quality content with such services. This is a great way to get a cheap paper, but we would not recommend it to those who need high-quality content. Round-the-clock customer support, free features and 300 words per page are only a few advantages essaychief.com promises to their customers. Being on the market since 2002 has allowed this provider to deliver various academic papers to students worldwide. However, despite the long time this company has remained on the market, their website is amazingly simple. As we said, EssayChief is a company that offers all the commonly requested services. Additionally, there is an option in the Ordering section called ‘other’, which means you can ask for any type of academic paper from this provider. Finding a list of services on the official website was difficult because the website is very hard to navigate. The content is simply scribbled on the homepage and there are no separate pages for services, discounts, blogs or even an ‘About us’ page. You can see a vaguely written list of services on the bottom of the homepage, as well as in the Ordering section. Customers can check the prices in the ‘Price quote’ page where the only thing they need to enter is a deadline and number of pages. This is really strange since essaychief.com is the only company we know that provides all types of papers for the same price. Writing services usually have different prices for easy and complex papers, as well as papers for a low and high academic level. Taking this into consideration, we seriously doubt the quality of content this company provides. The pricing also indicates that this is the case since it is much lower than that of other writing services. Prices here start from $7.75 for 14 days and range up to $39.95 for 3 hours, regardless of the type of paper or academic level of the student. The only discount option with Essaychief.com is 10% off for returning customers. Apparently, once you make a purchase with the service, you will get log in information that you can later use to enjoy this discount. This means that there is no first-order discount, bulk discount or an accumulating lifelong discount that allows you to get lower prices after making more purchases. Once we saw that the service provides all types of papers for the same price and offers a money-back guarantee ‘for missed deadline’, we decided to check online feedback and see if the company delivers quality content on time. Unfortunately, there are many comments that indicate the company misses deadlines or provides bad quality content. All things considered, this is not a service we would recommend. The quote on the official website of DarwinEssay.net says ‘follow our writing service to get the best writing essays ever in time, creative and sound’. What do they mean by ‘follow’ and where can you follow the service? This sentence is very vague and wrong in several ways, which makes us wonder if the service is truly the best content provider. Read on to see what we found out. Even though the company’s name indicates that they work on essays, DarwinEssay actually offers a wider range of academic services. Since there is no Services page on the website, you should check the dropdown list on the calculator on the homepage. What we found to be confusing is that the majority of commonly requested papers come under the ‘Essays’ category. How can case studies, movie reviews and research papers be considered as essays? According to the Pricing page, prices do not apply to a specific type of paper, but to a separate category. However, since the categories here are different from those on the calculator, we do not know which papers go in which category. Prices start from $9.97 per page for undergraduate level papers with a deadline of 14 days and range up to $197 for admission content with a deadline of only 3 hours. This means that the company is really affordable, as they promise on the website. Once we opened the website, a pop-up that said ‘special offer for clients from your country’ appeared. This is a bit transparent since it obviously appears to every visitor, regardless of their location. However, it is still a special offer that, at the moment, means you get free VIP customer service with your order. According to the website info, customers can get a one-time discount that ranges from 5% to 10%, depending on the order price. However, this discount does not apply to orders under $30. Furthermore, if you want to enjoy a discount later on, you can only do this if you contact their customer service and if your order is over at least $500. After evaluating DarwinEssay.net, we can conclude that this service is not a good choice for your papers. The biggest disadvantage is the discount policy since there are no first-order discounts or lifelong discounts. They only have a one-time discount that is limited and bulk discounts that are very hard to get. Additionally, the company’s website is far from good and contains many mistakes in terms of content. 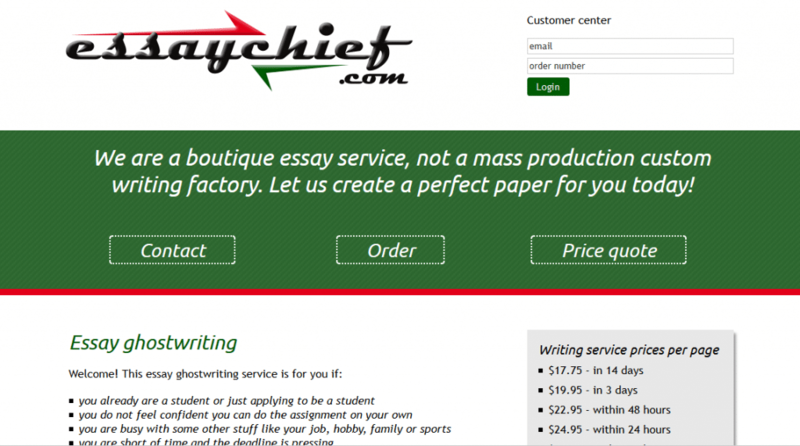 According to the official website of ClazWriters, this company is the best place to get your essay papers done. However, this is not the only academic paper the service provides. In order to see what they have to offer and at what price, check out our evaluation of clazwriters.com. ClazWriters has what we consider to be one of the biggest lists of writing services, containing both the most commonly ordered and more specific types of academic papers. There is a separate page that lists all services the company offers. However, if one decides to look into it, they would have to spend hours reading irrelevant content. After a careful evaluation of the content on the website, we would say it needs immediate and full reconstruction. The numerous mistakes in content in the Services page gives the impression of the company being unprofessional, since this is something that no writing company should ever allow. Customers can calculate the quote of their paper by using the free calculator on the homepage or the Prices page. According to the calculator, prices depend on the type of academic paper, urgency, academic level, quality of paper and number of pages. Discounts are also calculated here. An admission essay for Masters level with a 2:1 Standard quality and a deadline of 5 days would cost $ 23.14, which can be considered an average price. Higher academic level papers are more expensive. What we found to be confusing is that the company offers 6 types of academic quality: average, guaranteed distinction, guaranteed merit, guaranteed pass, premium and standard. We cannot understand the difference between the different standards since, for example, papers of guaranteed distinction and premium quality cost the same. As we said, the calculator reduces the price immediately by adding a discount that ranges from 5% to 20%. This means that everyone will get a discount, regardless of him or her being a new or returning customer. This makes the company a bad choice for regular customers, since the discount would depend on their current order instead of accumulated orders. Overall, clazwriters.com is not the best choice for a content provider. The prices are good, but their discount policy does not include any benefits for regular customers. Furthermore, many people have reported that the company delivered bad content, which we assume is a result of them offering too many writing services. For a company to be able to deliver high-quality content for all these types of paper, they would have to hire hundreds of writing experts. Trendy design and inviting content is the first impression you will get once you open the official website of the custom writing service called boomessays.com. The aim of this review is to inform you of the quality of services and pricing this company offers to students worldwide. Read on. Boom Essays is a company that claims to be ‘geared towards college students’, providing high-quality custom written papers for affordable prices. However, do not let this misguide you since it is obviously a case of mistake in content. Even though they have stated this on the homepage of the official website, their papers are available to students of every academic level, starting from high school to doctoral level. A single page of a high school essay costs from $12.99 to $35.99 per page, depending on the deadline. This is not a high price and would be considered average when compared to those of other companies. However, the prices for higher academic levels are much higher than those for high school level, which makes the company an expensive one. For example, a dissertation with a deadline of 10 days costs $23.99 per page! Boomessays.com offers two discount options. The first one is the first-order discount of 15%, which you can use by entering a discount code. The second is a lifelong discount option that ranges from 5% to 15%, depending on the accumulated orders a customer has. This lifelong discount looks inviting, but the company requires a large amount of ordered content to provide you with 10% or 15% off. In order to get the 10% discount, you need to order over 50 pages, while for the biggest discount you need to order over 100 pages! We contacted the customer service in regards of bulk orders, but the live chat option is not very functional. It took 15 minutes for an agent to reply and he was not helpful at all. All things considered, BoomEssays is not a service we would recommend to those in need of affordable, quality papers. The prices here are above the average range and feedback online is so varied, that we cannot guarantee the quality of content, either.